If you’d said ‘cream eyeshadow’ to me a decade ago, I would’ve flinched and thought oi oi chav, are you Daphne and Celeste? Over the years, that stigma has been replaced with a product that doesn’t have to be light blue and blended up to your eyebrow (but if, you know, you can pull that off, good for you). The ‘drugstore’ – can we seriously think of a British term already?! – has an impressive offering when it comes to cream eyeshadows. I’ve collated a few over the years and recently added a cranberry offering to the mix… Let’s begin. 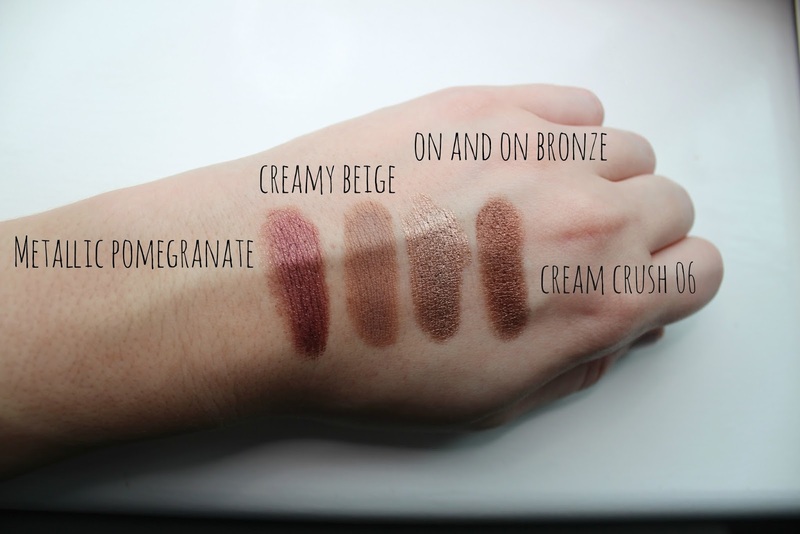 Maybelline is your best friend here and makes up three of the four offerings I’ve swatched. Their 24 hour colour tattoo range is brilliant, with impressive colour pay off and good longevity with a pop of eye primer beforehand. I first picked up the shade Creamy Beige, which is part of their leather effect range. It’s a buildable shade that’s great used as a base colour for all you gals with dark lids. On and On Bronze is a shade I picked up last year and is one of those handy colours that looks suitable for daywear but also great for nights out with a slick of eyeliner. I would say it’s slightly more gold than actually bronze, and it’s a great dupe for Charlotte Tilbury’s new Eyes to Mesmerise cream shadow collection in the shade Marie Antoinette. The newest addition to my collection is Metallic Pomegranate, the perfect cranberry tone that I never thought I’d be brave enough to sport but actually looks really lovely as an added pop of colour. Would you like to see a festive tutorial using this shade? Let me know! Last but by no means least, we have the offering from my beloved Kiko. The brand can easily be grouped with Boots and Superdrug because it’s just so bloody affordable with really great quality. Their cream crush shadow in the shade 06 is a rusty bronze tone, particularly effective on those with darker hair and one that I’ll be busting out come Christmas time. Which cream eyeshadows am I missing from my collection? It's so odd that Maybelline has the exact same shades, but different names for the Color Tattoo shadows in the US. I really like Chocolate Suede (it's a cooler deep brown with a bit of a shimmer) if you can find the UK variant of that. That is strange! I find the US seem to have much more choice with these kind of things!